Steven (Chicagoland, United States) on 25 January 2018 in Architecture and Portfolio. 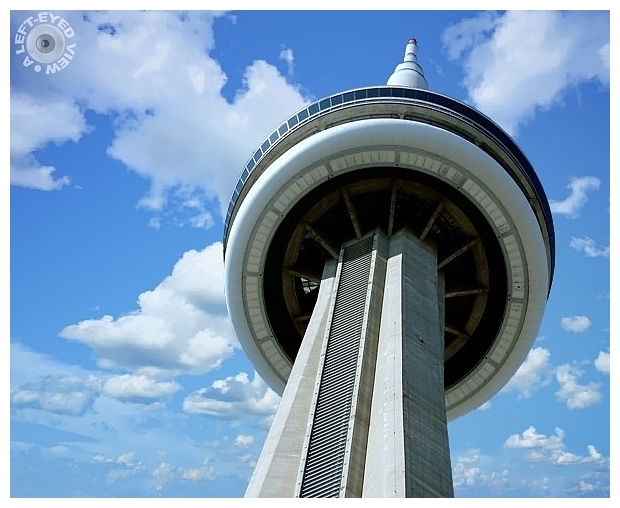 The CN Tower is a concrete communications and observation tower that rises 1,815.3 feet in downtown Toronto, Ontario, Canada. Built on the former Railway Lands, it was completed in 1976, and held the record for the world's tallest free-standing structure for 32 years from 1975–2007 and was the world's tallest tower until 2009 being overtaken by Burj Khalifa and Canton Tower, respectively. It is now the third tallest tower in the world and remains the tallest free-standing structure in the Western Hemisphere, a signature icon of Toronto's skyline. Cropping out most of the base, I believe, made the tower much more attractive from this "less revealing" point of view. Photo captured on September 29, 2017. Quelle tour vue par le dessous quel rond et ciel superbe. A great POV. I've been up there a number of times. excellent composition, nice point of view ! What an impressive tower, and what a clever and effective angle and perspective to show it. I once saw a documentary about how it was built, and that was extremely interesting and inspiring. I like the view point lookng up at this impressive tower. Nice detail and color. Perfect POV and the crop worked well. It looks like a sleek spaceship ready to blastoff. Beautiful capture. A spectacular point of view! I think that it is amazing that it was totally built from concrete. A fabulous image and great information. A wonderful point of view. interesting point of view. you make it seem like a rocket poised for a trip to Mars. Terrific shot, Steven - I love the angle with the blue sky & fluffy clouds!! An out of the ordinary POV that really makes this a unique shot. You usually have beautiful blue skies in your architectural images and this is another ! Angle and point of view very well chosen. The presence of the clouds, is the cherry on top of the cake. A very space-age angle - bravo! Such a beautiful structure....I would love to see it in person..Great image, Steven! It looks slightly shorter without the base? !